KIRKUS REVIEWA U.S. Navy physician shares his secrets for a more successful life in this self-help work.Mathurin conceived of his debut book when he realized how critical checklists are in the worlds of naval aviation and medicine. Itemized lists, he says, help avoid flight mishaps and operating room errors, so he wondered, "e;Why not apply this same concept to people's lives to help them achi… eve their highest potential? 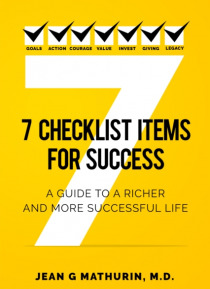 "e; That epiphany resulted in this book-a kind of instruction manual for living that breaks achievement into seven "e;checklist items"e;: "e;Goals,"e; "e;Take Action,"e; "e;Courage to Consistently Commit,"e; "e;Value Resources,"e; "e;Investing in Yourself and Others,"e; "e;Giving Back,"e; and "e;Create a Legacy of Service to Others. "e; An introductory section helpfully explains each of the core concepts, in brief, and these same blocks of text are repeated at the beginning of each of seven chapters. The items themselves are unlikely to be new to most readers, as many of the ideas are common in self-help literature (such as "e;Have the courage to go the extra mile with everything that you do, each and every time"e;). But the presentation of the material feels more novel, as the overarching checklist concept isn't taken literally; the book's merit derives from the idea that one can systematically address several broad areas in the quest for a fuller life. At the very least, this notion gives the book a highly focused structure that makes it easy for readers to navigate.Unsurprisingly, given the author's military and medical background, there's a sense of logic and precision to this book. Each chapter's content is uniformly positive and always emphasizes proactivity, but it's also clear that the book isn't intended to highlight step-by-step procedure. Instead, it offers a wide-ranging, general discussion of each list item, using examples and personal anecdotes to illustrate specific points. To that end, Mathurin writes from a very personal perspective-sharing, for example, how he grew up in poverty in Haiti-and he explains with some eloquence how he used the principles that he lays out in his book to "e;transform [his] life from famine to abundance. "e; He writes with a great deal of insight, as well, offering not only accounts of his own experiences, but also the wisdom of others, such as investor Warren Buffett and the late self-help authors Zig Ziglar and Napoleon Hill. Mathurin's style often takes an inspirational tone, as he exudes a sense of confidence in his approach to life: "e;Success,"e; writes Mathurin, "e;is only ten percent intention and ninety percent action. "e; About leading others, he writes, "e;always strive to be the leader you would want to follow; strive to be the calm voice in the midst of the chaos, and-while you are at it-strive to be the change that you want to see. "e; Finally, Mathurin stresses that you can "e;lay the path to your legacy by focusing on giving back the acts of kindness you have received along the way. "e;A book of noble, sincere, and expressive advice for living.